Large and small, residential and commercial. 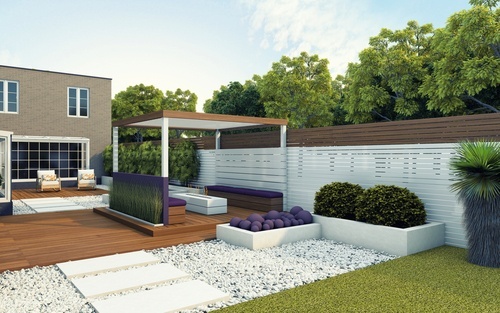 StoneSet has been applied to hundreds of courtyards and patios across Australia. If you’re looking at courtyard paving options or outdoor paving when resurfacing patios, there are some key advantages of using StoneSet. When weighing up paving alternatives and outdoor paving for the patio surface it’s to your benefit to consider all of StoneSets advantage points below. Outdoor paving materials should look decorative, can withstand heavy foot traffic, are slip resistant and easy to maintain. StoneSet meets all these criteria with the added bonus of being very fast to install. Before you consider painting external terracotta tiles or changing the colour of external terracotta tiles, consider the option to resurface patio paving with StoneSet’s natural stone permeable paving. StoneSet’s high quality flexible polyurethane resin binds natural stone or recycled glass at the contact points leaving natural voids between stones for a porous result that allows rain or irrigation water and air to pass through to the earth below. The hardened surface resists slips for safety and minimizes puddles quickly for mosquito prevention in your playful patio area. StoneSet’s hardscaping compliments any home’s architecture and provides a durable surface to support your outdoor furniture, grill, and bar and the children’s playground equipment or toy storage benches.